My (cross-)posting of this particular Westlake Score was prompted by a newspaper article I noticed last month. 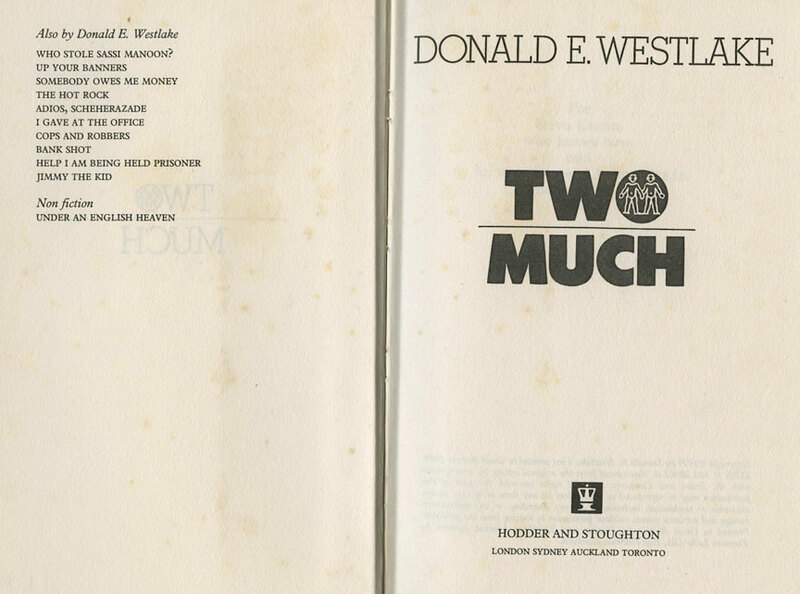 I actually bought the book in question – the British first edition of Donald E. Westlake's Two Much!, published in hardback by Hodder & Stoughton in 1976, the year after the US M. Evans edition – on a whim on Amazon Marketplace at the tail end of 2012 and have had it sitting on my to-be-blogged-about shelves ever since; the Hodder edition is incredibly scarce, and it's hard for me to resist scarce books – especially Westlake ones – when I encounter them. That said, Two Much! doesn't number among Westlake's more celebrated works; pretty much the only reputable reviews of the novel readily available online are this glib Kirkus Reviews one and Ethan Iverson's capsule review as part of his "A Storyteller That Got the Details Right" essay (Ethan places it in Westlake's canon as "probably the darkest of all the humorous crime novels"). It's perhaps better known for its 1995 Hollywood film adaptation – which in turn is arguably better known for the on-set romance which developed between co-stars Antonio Banderas and Melanie Griffith – and for its 1984 French film adaptation, Le Jumeau (The Twin). All of which was why I was quite surprised when it cropped up in a Guardian article in March. Written by author Stephen May and titled "The Top 10 Imposters in Fiction", the article caught my eye principally due to a mention of Tom Ripley in its standfirst. Being, as I am, a Ripley obsessive, naturally I took a look to see which of Patricia Highsmith's five Tom Ripley novels had been included (the first, The Talented Mr. Ripley, unsurprisingly; you could make just as strong a case for Ripley Under Ground, but May does at least nod to the greater Ripliad), and there, in the number two position (appropriately enough), was Two Much! It's difficult to tell whether May has read any other Westlake works besides Two Much! 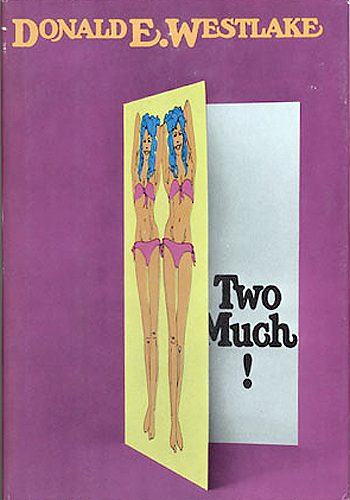 – or indeed Two Much! itself; he does little more than recount the plot – but he's obviously aware of Westlake's wider oeuvre, noting that the author "published books under at least 16 names". Except to my mind the Hodder jacket isn't as well executed. Because while the Evans jacket clearly shows a risque greetings card – the writing of which being the narrator of the novel's profession – it's much less obvious, at least to my eye, that that's what we're supposed to be seeing on the Hodder cover. Still, given how uncommon the Hodder first is – as opposed to the Evans first, of which there are getting on for fifty copies on AbeBooks alone – I know which I'd rather have in my collection. UPDATE, 11/4/14: The front of the jacket of the Hodder edition of Two Much! has now been added to the Existential Ennui British Thriller Book Cover Design of the 1970s and 1980s gallery. 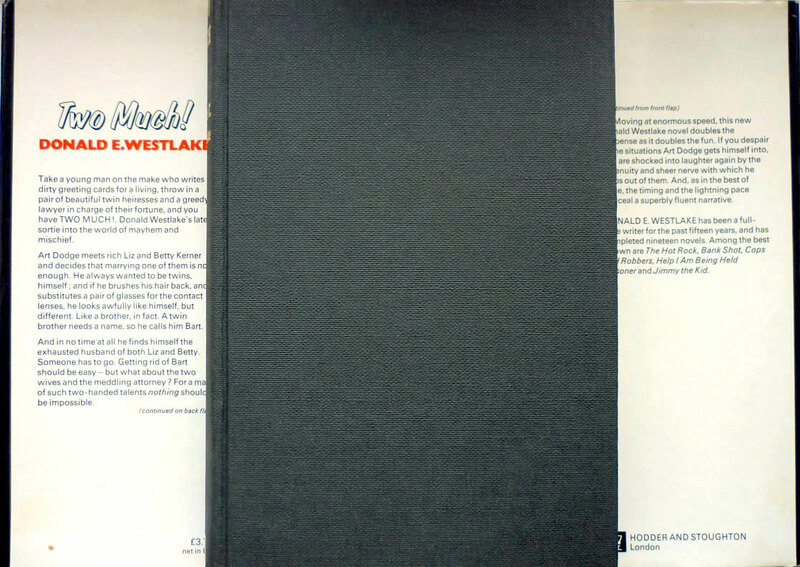 When you write about scarce Westlake, I always want to ask about prices. But I'm shy. I won't. Never as much as you might think, Ray. I've never been able to afford really expensive books, and even less so these days, what with having a family to support. I do allude to prices paid in some posts, but I'm never sure how interested people are in that sort of thing. Happy to tell you in this case though: digging back through my emails, I see I paid £12.88, plus postage. Not much for that scarce a book. Amazon MarketPlace can be a money saver sometimes, but when it comes to book description, it's the worst place on the Net. Though I bought only once from AMP, they started to ship to Russia only recently. You can find really scarce books there for cheap, the only problem is you have to dig through tons of rubbish. You do indeed, but sometimes it's worth it. 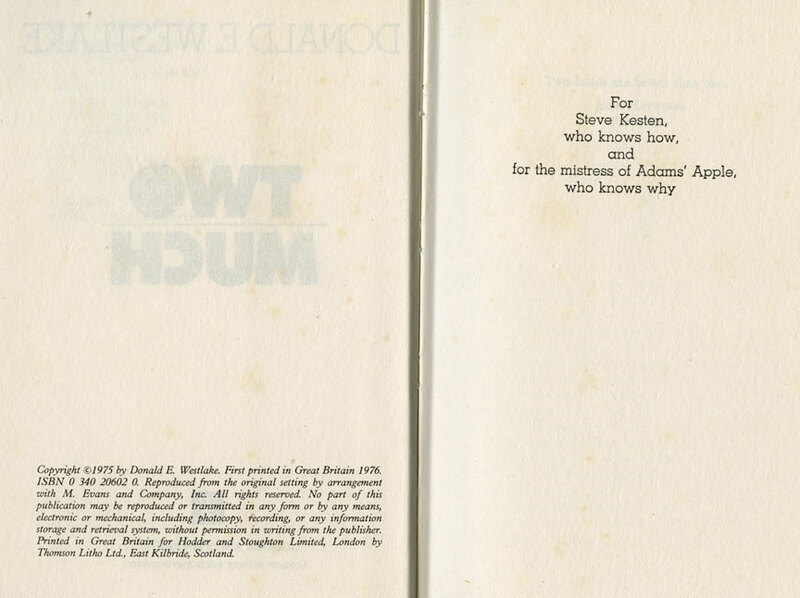 I found a signed book on Marketplace just the other week – a spy novel from the '50s (I won't say what it is yet – to be revealed) bearing a great inscription, one of only half a dozen signed-on-the-page books by this author I'm aware of, and certainly the earliest – for a tenner. I have a much less rare paperback edition with truly garish cover art--just wanted a reading copy, and trust me when I say this book is the goods, in any edition. Westlake in absolutely top form. One of his most interesting protagonists--he doesn't usually write about unmitigated cads. Grofield, I suppose, has a bit of cad in him, but he's so wrapped both his professions, we don't get to see much of that. 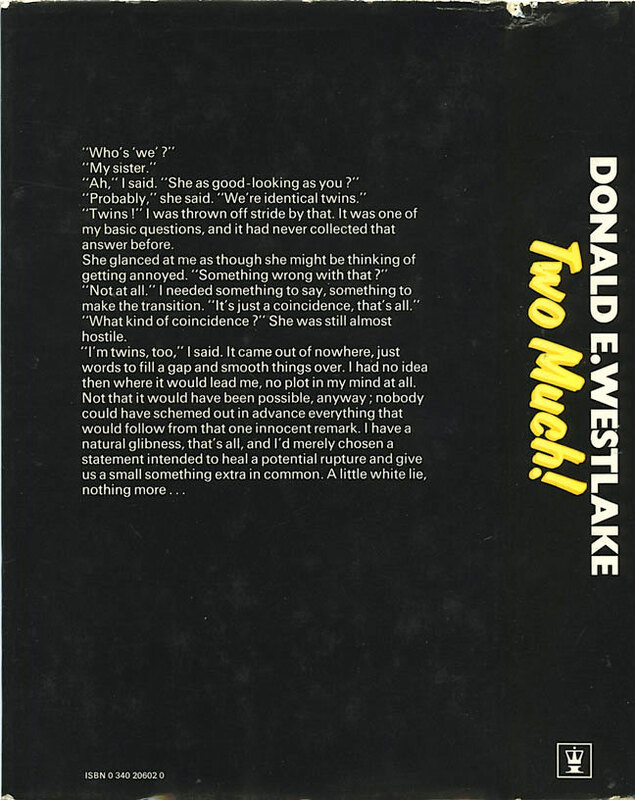 The protagonist of Two Much is 100% grade-A cad. Must have taken a correspondence course with George Sanders. It's basically bedroom farce most of the way. Then it changes course. Very tough book to type. Not so easy to put down, either. Interesting look at the summering community of Fire Island, NY, which Westlake must have been a part of for a while. Anyway, I'll get around to reviewing it on my blog at some point. Aha, you have a Westlake blog! About time. I'll have to have a proper read when I get a minute.